Today we have a Carddies set to give away to one of our lucky readers! They come in fun sets: some sets are ready now, and many more are on their way! 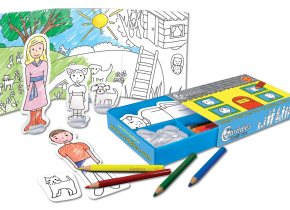 Carddies sets appeal to girls and to boys aged 3 to 99! Carddies are packaged in a perfect, robust card box. You can carry them everywhere! Open to UK residents only. A winner will be picked via rafflecopter at random and prize will be sent from the company themselves and not myself. The winner will be notfied via email and then I will require your full name and address to pass on to the company for your prize to be sent. The family 1 carrddies set. The london set would be great for my nieces in Australia. The london set though the others are tempting too. Fairies please Rachel is really into her fairy stories and everything to do with fairies. The Family one set for my grandson , he would love this. The fairies set would be lovely thank you! The fairies set, My girls would love it. The London set for my mother in law!